Use the meme above to promote this article on Twitter. The Republicans are taking another try at a healthcare law to repeal parts of the Affordable Care Act (ACA) after their stunning failure to even vote on the American Health Care Act (AHCA). Under the new bill, which has yet to be drafted, the current national requirements for what insurance must cover would be left up to the states to determine; and people with a serious illness could face a massive increase in premiums, putting insurance out of reach for many who need it most. One of those rules requires insurers to cover a set of 10 “essential” benefits. These include everything from prescription drugs and hospitalization to mental health and maternity care. Another rule prohibits insurers from charging higher premiums to people at high risk of getting sick. The wonky term for this is “community rating,” because it means everybody in the community is paying the same price, regardless of health status. Getting rid of community rating in particular would eviscerate Obamacare’s guarantee of coverage to people with pre-existing conditions. If insurers can charge somebody with medical problems exorbitant premiums, then a guarantee of coverage is basically meaningless. The White House is pushing because a two-week spring recess begins at the end of the week, creating a sense of urgency for Republicans who don’t want to return to their districts and face constituents without a healthcare victory or return home and be criticized for another unfinished proposal that leaves people without the insurance they need. Some Members who fear returning home without a completed bill are urging the leadership to delay the spring break and complete the bill. They just do not want to face their constituents with this issue unresolved. The plan, if it goes forward, seems to be to rush the bill to the House Floor, without new committee review and without a Congressional Budget Office evaluation, by substituting the new bill for the failed ACHA. They need to rush this through because the more this is examined; the more people will see this bill is another terrible deal. Matt Fuller reports “…there are already more than a dozen moderate Republicans who have announced opposition to the bill, though they could still change their mind.” In addition, there is a lot of bad blood between the Freedom Caucus, The Tuesday Group and the White House and it remains to be seen whether Trump’s threats and bullying tactics will help or hurt their ability to reach agreement. Vice President Mike Pence, along with chief of staff Reince Priebus, Office of Management and Budget Director Mick Mulvaney and Andrew Bremberg, the director of White House domestic policy, briefed the Freedom Caucus on Monday night. The same group also briefed members of the more moderate Tuesday Group. One key provision of the new bill is to grant states the power to choose to apply for waivers to repeal two ACA regulations that require insurance companies to carry minimal requirements for insurance coverage and to provide insurance to those with pre-existing conditions. Mark Meadows, the chairman of the Freedom Caucus, described the situation as “There is no deal in principle. There is a solid idea that was offered.”Freedom Caucus leaders said they’re open to the idea but want to see the legislative text. White House officials are hoping to send the text to Capitol Hill as early as Tuesday night. Meadows does not expect an endorsement from the Freedom Caucus but seeks to be able to give Paul Ryan a whip count and says his caucus will not vote as a bloc. On the critical issue of pre-existing conditions the Republicans say they would keep the ACA’s provision that requires insurers to cover people with pre-existing conditions, but would allow premiums to rise making insurance unaffordable for people by allowing states to opt out of ‘community rating’ provisions that keep premiums in line with the community. Prior to the ACA, insurance companies would raise premiums on people with serious illnesses. Karen Pollitz, a senior fellow at the Henry J. Kaiser Family Foundation who studied those markets closely, said insurers would routinely charge three to five times what they charged healthy people. In one instance, she said, a Colorado insurer actually sought premiums that were 2,000 times the standard rate. But a majority of states ran high-risk pools before the Affordable Care Act, and the pools were notorious for high premiums and deductibles, along with annual or lifetime limits on coverage. In other words, the pools lacked the kind of coverage and protections that people with medical problems need ― and they frequently wouldn’t cover pre-existing conditions for six to 12 months. “Allowing insurers to price people with pre-existing conditions out of the market is eliminating pre-existing condition protection,” tweeted Toper Spiro, vice president for health policy at the Center for American Progress. 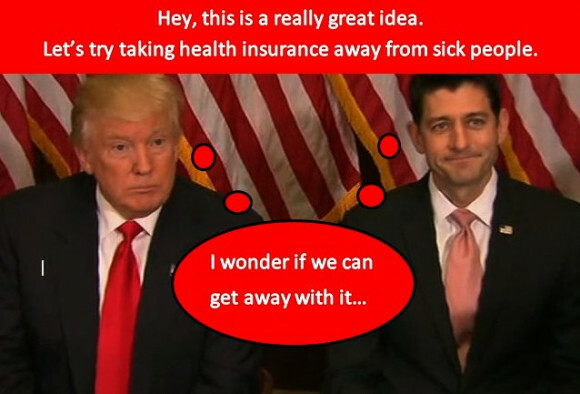 With the embarrassing implosion of the Republican Party over the ACHA, the party is now rushing this vague idea forward in order to pass something, even if it violates promises Republicans made in the 2016 campaign. It seems their view is passing a terrible bill is better than passing nothing, even if it only makes it through one Chamber of Congress. They need to move quickly because as this idea (not even a bill) is examined, its popularity will disappear and once again the Republicans will be pushing something the vast majority of people in the United States do not want. The disabled, and low-income retirees, rely on Medicare/Medicaid. On these, a pattern was set. Congress would threaten Medicare, causing a middle class uproar, at which point Congress would reconsider — and quietly cut away at Medicaid. It is considered it a victory when Congress steps back on cutting Medicare, ignoring the attacks on Medicaid. Medicaid provides coverage for essential (life-saving) prescriptions and treatments. No doubt. The Dems let the insurance industry write the ACA. They never bring up the real solution — improved Medicare for all — even though 80% of Dems support it. They will push some non-solution that does not threaten the insurance mafia like the public option (which, when used before has always helped private insurance by taking the most ill people off their hands). That is why we started Health Over Profit for Everyone, see http://www.HealthOverProfit.org. The campaign for National Improved Medicare for All is growing quickly. People should get involved.